WASHINGTON - Suggestions by the President and his Secretary of State that the U.S. did not fully support the Iraqi government have landed them in Guantanamo Bay, I Miss Fafblog, Spot has learned. 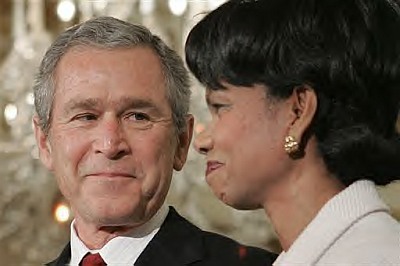 State Prime Minister of Iraq Nouri al-Maliki thundered that the suggestions by George W. Bush and Condoleeza Rice played into the hands of insurgents. "I believe such statements give a morale boost to the terrorists and push them toward making an extra effort making them believe they have defeated the American administration," he said to the L.A. Times. "But I can tell you, they haven't defeated the Iraqi government." Bush agreed with Maliki and in a stunning turn of events, demanded that he and his Secretary of State be arrested as "unlawful enemy combatants." Under the Military Commissions Act of 2006, the President is granted the extraordinary power to indefinitely detain himself and Ms. Rice for "purposefully and materially" supporting anti-U.S. hostilities. The bill also rejects their right to a speedy trial and limits their traditional right to self-representation, but it does allow the President to "set the rules" for their interrogations.